The world of wartime espionage lost one of its most colorful characters early this month when Nancy Wake, just a few days shy of her 99th birthday, passed away in London. In fact, when it comes to messing with the Germans during World War II, Nancy Grace Augusta Wake Fiocca Forward may be the ultimate pièce de resistance. Like so many of the women who were to join the resistance movement on the European Continent, Ms. Wake fell into the role quite by accident after finding herself behind enemy lines. But the big difference with Nancy Wake wasn’t only that she survived – because a goodly number of them didn’t – but also her deadly effectiveness in the role of spy. Nancy Wake’s early life could never have foretold living the adrenaline-rush life of a secret agent. She was a New Zealander, born in 1912 in Wellington. A few years later, her family moved to Sydney, Australia. But her journalist father soon abandoned the family, so Nancy’s early life was one of some privation in a family of six children headed by a single mother. At the age of 16, Nancy decided to leave home, using a small inheritance from an aunt to sail for England in 1928. Here’s where Nancy’s life begins to take on the contours of a spy thriller. First, the plucky young woman bluffs her way into a job in journalism with the Hearst newspaper chain by claiming she is fluent in “Egyptian” – never mind that no such language exists. Once ensconced into a crack news reporter position, she is sent to Paris as a correspondent. There, Nancy becomes increasingly alarmed by the Nazi saber-rattling occurring on the other side of the Rhine River … but at the same time she meets and marries Henri Fiocca, who happens to be the wealthy heir to a shipping company based in Marseilles. Just one year into the marriage, however, the German tanks rolled into France. At first, Nancy became an ambulance driver, and from there became involved in manning escape lines from her home in Marseilles as people of all stripes desperately sought safe passage to neutral Spain. Among her early exploits were hiding people on the run, giving lavish cash payoffs to guards to free prisoners, and becoming a communications courier for the French resistance. Not surprisingly, these doings made her known to the Germans as a key figure in the resistance movement – one who needed to be neutralized at all cost. In fact, at one point she was tops on the Gestapo’s “most wanted” list. Heeding advice from her husband and friends to leave the country while she still had the opportunity, Nancy made her way back to England by way of Gibraltar. Her husband had made plans to join her after settling his business affairs in Marseilles, but the Germans made short work of that by torturing and then killing him – presumably because he refused to divulge information about his wife’s whereabouts. Nancy was not to learn of her husband’s fate until the end of the war. Meanwhile, her trip to England via Spain and Gibraltar was a harrowing one involving switching from coal trucks to trains and ships … evading German soldiers and bullets along the way. But was that the end of her spying career? Hardly. Nancy spent eight months of training in the British special operations forces, then parachuted back into central France in 1944 to work as a communications liaison between London and the local Maquis resistance. Amusingly, she would later recount how her descent into the French countryside was not particularly elegant; the local Maquis leader, Capt. Henri Tardivat, found her tangled in a tree. 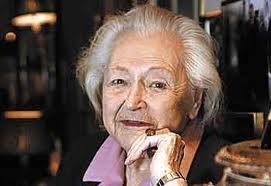 It would be hard to overstate the contribution Nancy Wake made to the resistance movement in France. Not only did she take care of finances, she allocated the arms and equipment that were being parachuted and smuggled into the country. She was also responsible for recruiting many new members to the movement – so that the resistance force eventually numbered ~7,500 people. And boy, did they ever wreak havoc on the German occupiers! It’s estimated that from April 1944 until the liberation of France, the Maquis fought ~22,000 German SS soldiers and caused ~1,400 casualties while taking fewer than 100 themselves. Nancy did her part; she was a good marksman, and even killed an SS guard with her bare hands on one of the Maquis’ many raids in order to prevent him from sounding the alarm to his fellow soldiers. 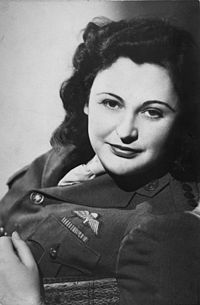 At the end of the war, Nancy Wake was all of 33 years old, yet had already lived a veritable lifetime of excitement and action. In the postwar period, she divided her time between Australia and England, becoming involved in leftish politics and also working as an intelligence officer … eventually remarrying and settling in England for good. Her popular 1985 memoir, The White Mouse, was so titled because it had been the name the Gestapo bestowed on her for her deft ability to avoid the traps that had been set for her. In later years, Nancy Wake became a resident of the fashionable Stafford Hotel in London’s St. James Place (Picadilly), which had served as a British and American services club during the war. In fact, its bar had been the place where Nancy had been introduced to alcohol many years before. Evidently quite the character well into her 90s, she could be found at the hotel bar every morning, enjoying the bar’s first gin and tonic of the day. Now that’s what I call style! ← Reading the tea leaves in the U.S. population census results. I have heard of Nancy Wake when I studied World War II as a kid in history class (my favourite subject in school). She’s maybe gone, but she is never forgotten. She is a hero who risked her life for the greater good. Let her legacy be known by us and by future generations to recognize that a great woman like Nancy existed.